Engineers at NASA's Glenn Research Center are advancing the propulsion system that will propel the first ever mission to redirect an asteroid for astronauts to explore in the 2020s. 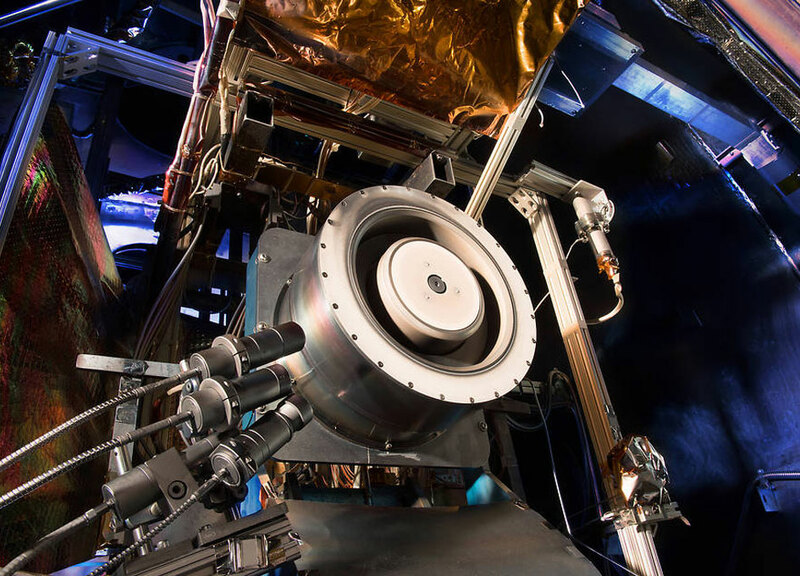 NASA's Asteroid Redirect Mission will test a number of new capabilities, like advanced Solar Electric Propulsion (SEP), needed for future astronaut expeditions into deep space, including to Mars. The Hall thruster is part of an SEP system that uses 10 times less propellant than equivalent chemical rockets. In a recent test, engineers from Glenn and the Jet Propulsion Laboratory, using a Glenn vacuum chamber to simulate the space environment, successfully tested a new, higher power Hall thruster design, which is more efficient and has longer life. "We proved that this thruster can process three times the power of previous designs and increase efficiency by 50 percent," said Dan Herman, Electric Propulsion Subsystem lead. Hall thrusters trap electrons in a magnetic field and use them to ionize the onboard propellant. The magnetic field also generates an electric field that accelerates the charged ions creating an exhaust plume of plasma that pushes the spacecraft forward. This method delivers cost-effective, safe and highly efficient in-space propulsion for long duration missions. In addition to propelling an asteroid mission, this new thruster could be used to send large amounts of cargo, habitats and other architectures in support of human missions to Mars.